Spectre is on the table this time, which we haven't seen since the fall of Argen. What threat looms over us that demand for both Commandos and Ninjas? Also the drop is coming in hot, hitting in less than a week! Based on the description, it sounds like Noboto's new alternate head will be premiering in this drop. AutoDecept wrote: Based on the description, it sounds like Noboto's new alternate head will be premiering in this drop. I hadn't thought of that; now you have my attention! That side of the Glyninja head looks good on the crayhunter build. What could it even be? A helmet to match the Glyarmor? An even more alien face? A sad Noboto? (Okay, maybe not the last one.) Weird to think that we could be finding out in three days! Glowing tentacles on all the things, if true. If they drop the Bio Master and these guys I'm gonna have one hell of a dilemma. Nice to see Glyans getting some love recently though. i really doubt bio masters this month but soon for sure. and hopefully mikemz's zullan will be soon after that. really looking forward to see the new noboto head and whatever other "slight but signifigant" changes the mold went thru. between this drop and the glow gamma x, its gonna be one glow-y week! ChristheElder wrote: i really doubt bio masters this month but soon for sure. and hopefully mikemz's zullan will be soon after that. Exactly what I was thinking, too. new head does look neat. i wonder if armored up nobotos (like denniken and marezioc) are going to be standard issue nowadays. also, what do you think the chances are of a spectre super cray? ChristheElder wrote: new head does look neat. i wonder if armored up nobotos (like denniken and marezioc) are going to be standard issue nowadays. All of the above, please! Also wonder with all of this GITD being released if there's a chance this drop will involve another OSM cross over, and the second installment of the comic? I doubt any GITD vinyls would ever come back, GITD and Clear are extinct relics. Definitely need a GITD Supercrayboth. O-M-G!!!! that is SO freakin awesome. i love it. and @ nopaintrequired - really? glow vinyl is extinct? that sux. i had no idea. what was/is the reason? ChristheElder wrote: really? glow vinyl is extinct? that sux. i had no idea. what was/is the reason? While I'm not sure why, the last time was GITD Vinyl sold on Onell Design's site was back in 2011. 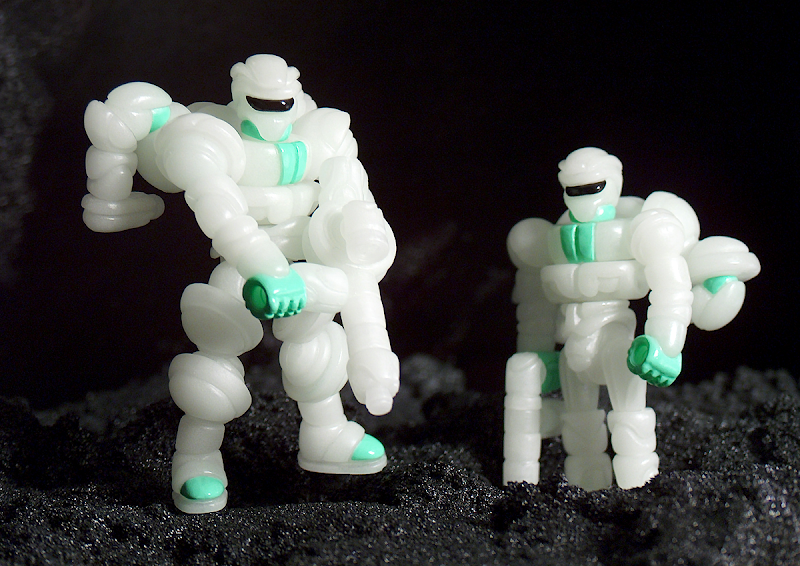 This is for both a RealHead Vinyl and a Glyos Vinyl. I'm not sure where it was said, but I'm pretty sure the reason is that it's a lot more expensive to produce. I've never seen a specific reason given for GITD vinyl but the clear vinyl had one last big run in 2012 and if memory serves Matt stated why they wouldn't be doing clear again. 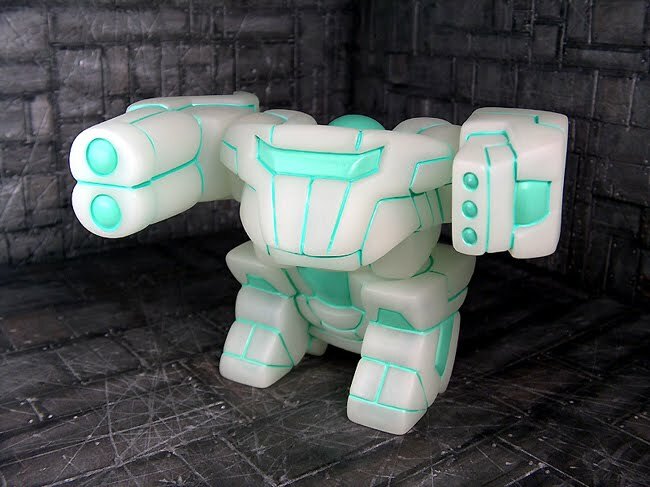 It's definitely on the blog, that's around the time I came into Glyos which was right before the big Volkriun drop with the debuting Armorvor. Anyway, there were issues with the clear vinyl such as swirling which caused it not to be as clear as hoped. I also think eventual yellowing was another issue but I don't think it was specifically stated. I'd love a GITD Armodoc/Syclodoc for my collection and clear vinyl would be great for some custom vehicle/vessel creations. Back to the new Nobby noggin, the eye slits paired with the flaring sides give a new sinister look to the Noboto figure mold. Picture it flattened a bit more and it kinda favors Skeleden's axe. I think Solaris or pink glow was discontinued in pvc too. I have a Solaris Exellis that turned yellow-brownish. Still glows, but no longer pink in light.